When something goes wrong with your kitchen sink, it’s a crisis. The kitchen is the center of your home, and without a working sink, it is tough to get anything done. You may be panicking, but if it is one of these common issues, you may be able to take care of the issue right away. When it comes to anything plumbing, we are not ones to discourage you from hiring a professional to take care of it, but not every plumbing issue will require a plumber. These common kitchen sink issues are relatively easy to figure out yourself, so go ahead and troubleshoot your problem with them and see if you can work it out. If not, you can always call us here at Hubbard Plumbing! While you may not be able to fix a leaky faucet without a professional plumber, you can at least check the cause to determine the source of the problem before you give us a call. The key is to determine where the leak starts. If it is near the base of the spout, it could be that your O-ring seal is damaged. 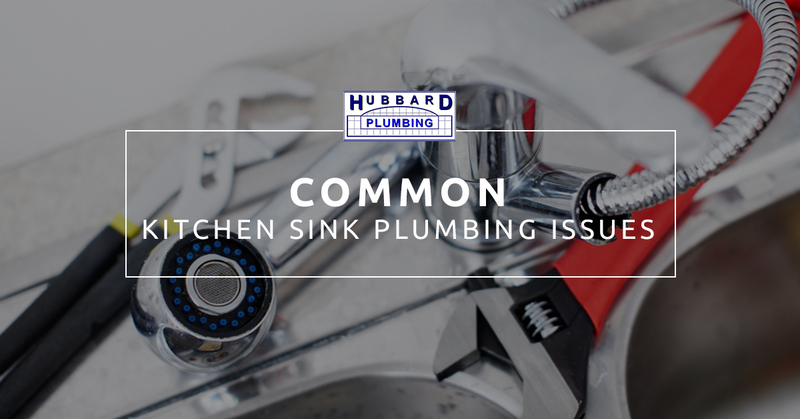 It’s common for older sinks to simply have worn out parts that need to be replaced. Before you investigate any leak, make sure to turn off the water first. If your sink is barely trickling when you turn the faucet, your low water pressure might be caused by a clogged aerator. In general, this occurs when dissolved minerals, such as calcium, build up in the openings of the aerator. This is very common if you have hard water, and it can be a chronic problem if you have water with a high-mineral count. Fortunately, the fix is pretty simple. Remove the aerator and place it in a plastic container filled with white vinegar. Leave it there for at least six hours, then remove it and reinstall it. If this is the problem, it will work like new again, and you won’t have to call us for our plumbing services. If this doesn’t work, this could speak to an overall water pressure issue in your house or clogged water pipes. If this is the case, give us a call and we can give you advice. Kitchen sink clogs are pretty common given how much organic matter goes into it. Every kitchen sink has a p-trap in order to prevent odors from entering your kitchen through the pipes. Unfortunately, due to its shape, it is also common for this part of the sink to get clogged with soap and grease. You can see if it is leaking by placing a bucket underneath. After that, you can loosen the slip nuts with a pipe wrench to remove the clog. This issue is especially common if you have a garbage disposal. If you don’t use enough water when putting something down your disposal, the food collects in the pipe under the sink, obstructing the sink from proper drainage. A plunger may give you the leverage you need to remove the clog, or a chemical drain cleaner, though a plumber is the best option. Regardless of the issue, we’re happy to help out! Contact Hubbard Plumbing for plumbing services in Suffolk County.